It was to be another hot weekend, in Osaka. This meant even worse in Nara. Yet that is where I was headed. It was the time I picked to make a second round as Komuso. I was feeling much more relaxed and actually looking forward to it. Well, except for the Heat, which was going to be brutal. I had that set in my mind, but also knew I could survive. I work outside in this doing labor, walking around playing would have it’s issues, but still for me a cake walk compared to raking cut foliage on the side of a 45 degree or more hill and loading that onto truck, in the sun. Now do not discount the unpleasantness and potentially dangerous issue with the sun and heat. I had already been told by Sempai, that he had been out early the other day and was beat down by noon. He does this every weekend and was beat down the last few days by noon. Nara can reach 95 and above in the summer, with high humidity ! That is what makes you feel heat!!!! Ok, stage is set, I was mentally prepared to suffer, I was in the severe training mode mentally. I set off rather early to get started early. That sort of went to plan, other than me taking the wrong train, therefore arrived late. I meet up with my Komuso Band members as they were heading out of our planned meeting spot to see if I would show up on the way. We returned to the Inn since I needed to check my stuff. So there at this Inn I got organized. I did not have the Kimono on this time, so I did not need to change. I was wearing my Samue, which was agreed upon. 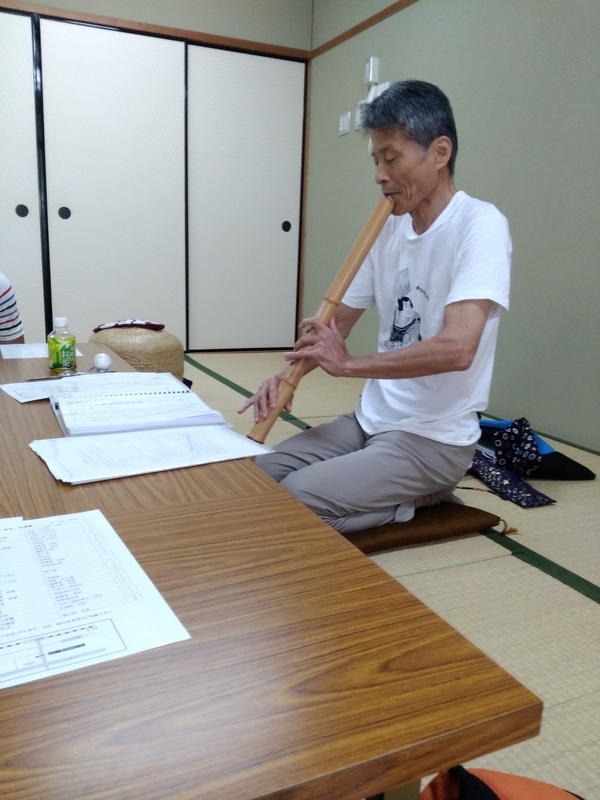 The visiting Shakuhachi player, a Shakuhachi sensei from Hawaii was also wearing a Samue, Sempai was wearing his white Kimono. The summer look for the Komuso. A wise choice in the Osaka area Summer. Our Sumae although dark, were open much more to air flow than a regular kimono. I felt this was a good balance, him in a kimono, us the novices in Samue, Sempai being the real Komuso. I prepared my gear, this time I was more prepared for what was ahead. I had purchased shoes that were not only good for walking they looked proper. 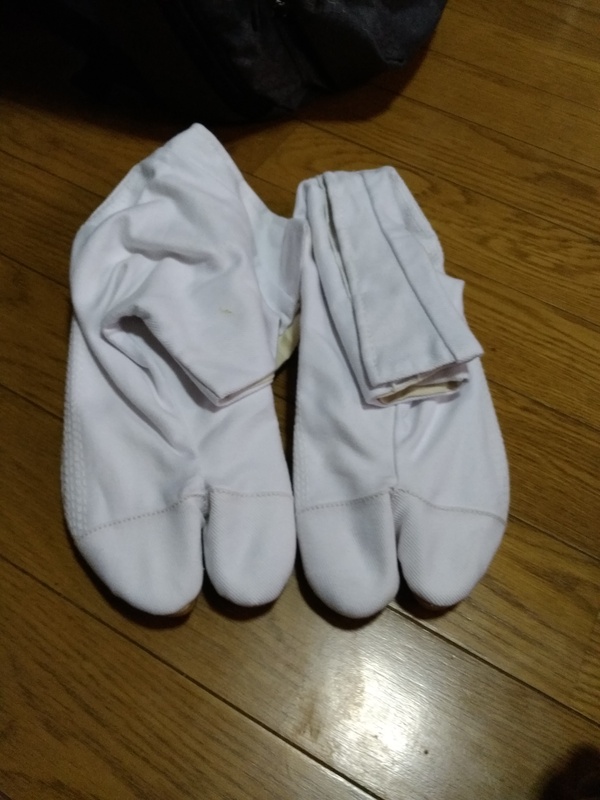 I had heard several remarks about my sandals on the last Komuso walk. I also had a small towel, which I would wear on my head. It was thicker than my Japanese head scarf, so I figured that would take of the slippage I had to deal with constantly on the last venue. Another helpful item were the several paper clips I brought along. They kept things in place on my clothes, without damaging them or being noticeable. It worked out just fine! I was set. However the visiting Shakuhachi sensei from Hawaii had a much more challenging time. Besides the heat really bothering him, he was struggling with wearing the sandals and walking with them. That was his challenge for this training run. We took things slow due to the heat and his sandals. We walked, played, and chatted. We saw the rent a guard from last time, who said nothing as he passed us. We were not stopped at the time, so there was no chance to see if the mistake, his, was corrected. 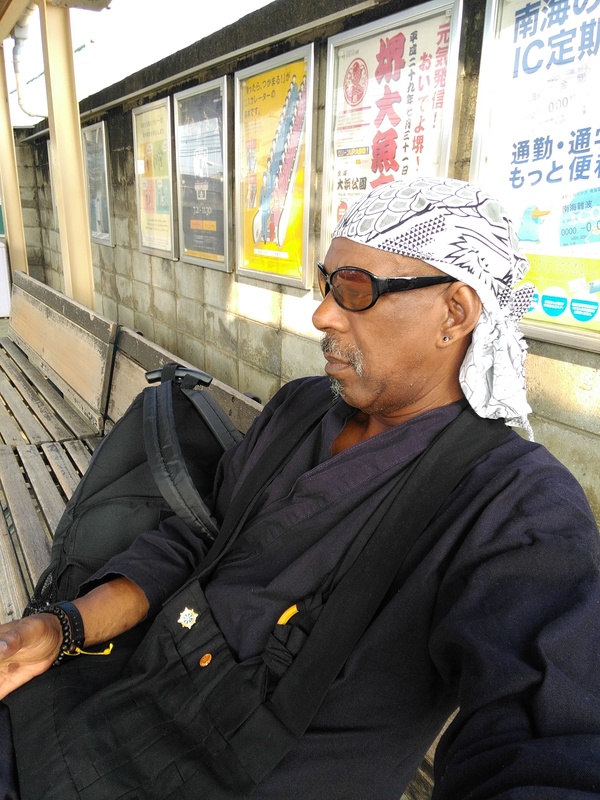 We spoke among ourselves about the role of a modern-day Komuso, interacting with the community, being an ambassador for Buddhism to the public, who do not in Japan get to interact with Priest generally. As before the elder Japanese were much more receptive to the “Komuso Priest” others were just curious and wanted photo OPs. Which is ok, it is getting the Modern image of a Komuso out there in regular life, not just for an event, a show…entertainment one could say. Since people mostly do not see Komuso except for some “event” where they parade to a temple, or through one. That is when the Komuso main force turns out for the “show”, to speak honestly. One is hard pressed to find a Modern Komuso out doing engaged Buddhist practice. Then on the other hand according to many accounts, one did not generally find them doing that in the old days. It was about playing for food and for their own enlightenment. At least this is what most historic accounts say, I have read. There was some engaged buddhist practices but not like the other sects as much. The engaged Buddhist practice of Sempai seems to be a new development and in my opinion, which means little, is needed. Buddhism is waning in Japan. Which one of the topics we discussed on our walk. The engaged Buddhist practice is not alive in Japan. Temples are mostly closed places, or off limits. Hard to get questions answered, Buddhist priest mostly show up for funerals, etc. There is very little out reach to the public. Some Buddhist are understanding that and are trying new ways to engage with the public, doing rap, running bars, and in Sempai’s case being out there doing Komuso practice regularly, not just for events. The day was good, even with the heat. Crowds were small because of the heat, which was to be expected. When I got off the train the sun was brutal! I found that being inside the Tengai was much more a relief. Last time we had some negative experience from the guard. This time the negativity came after all was over. 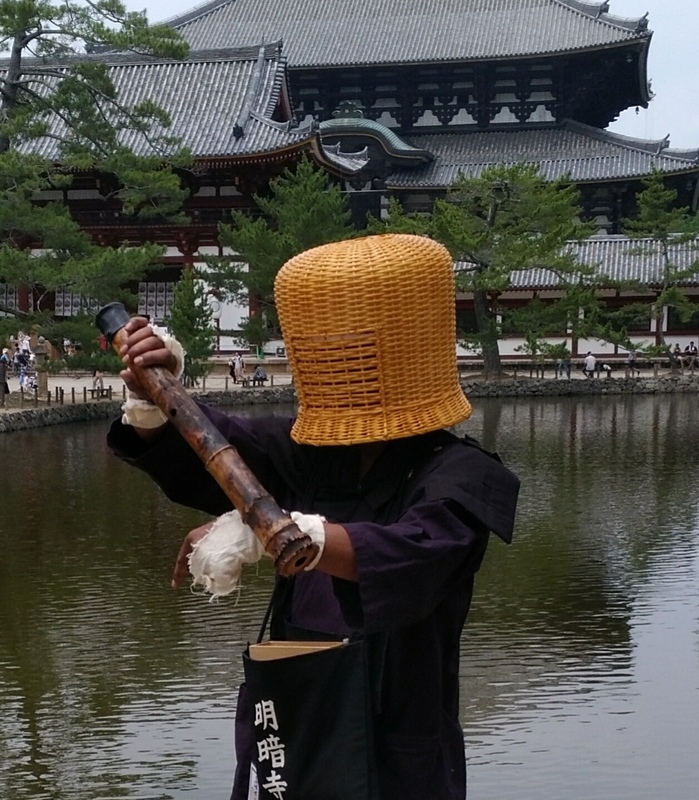 I posted picture of me, on Facebook as a Komuso in a fighting pose with the shakuhachi. It was rumored that since many of the Old Komuso were former Samurai they used their Shakuhachi as a weapon. This can be seen in some of the old Samurai movies. So I posted a pictured, with the good-natured caption Shaolin Komuso, since that is my Background training. It was commented on by the former Sensei of our little ronin Komuso band. Former because of a damaged ego by the Sensei. It said basically, Komuso practice is a serious study, it is not for entertainment! Wow! That pushed the wrong button with me. I did not think I was being disrespectful at all. I wrote a somewhat sharp reply for my wife to post in Japanese, since that is what he did. After some breathing and thought, I decided not to post that, and just did a simple response, “I am also a Zen Priest and requested any further comments be done via private communication”. 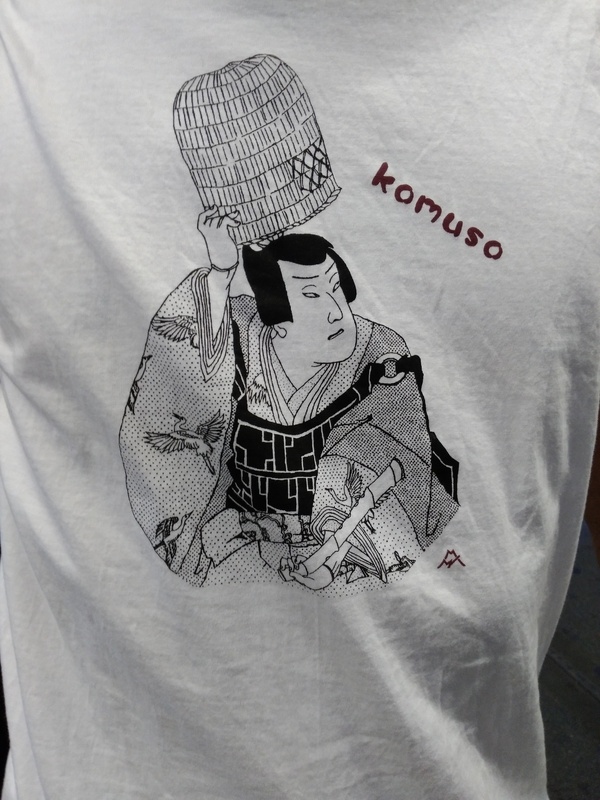 I also posted a few pictures of Komuso in Art, and Movies by Japanese. His only reply was he understood and acknowledged me. I am not sure what that meant. However he had no further comments online or privately. My wife followed his link and said. This guy is strange, he said he was going to the police! I said so what? I did nothing wrong, nor did anyone else in our group. It was said to me later by the Sempai he may go tell the Abbot in Kyoto. Sempai said also but again so what. “I will continue what I do and follow my engaged practice. Even if I have to be associated with another temple or start my own.” It will be interesting to see how this all plays out. 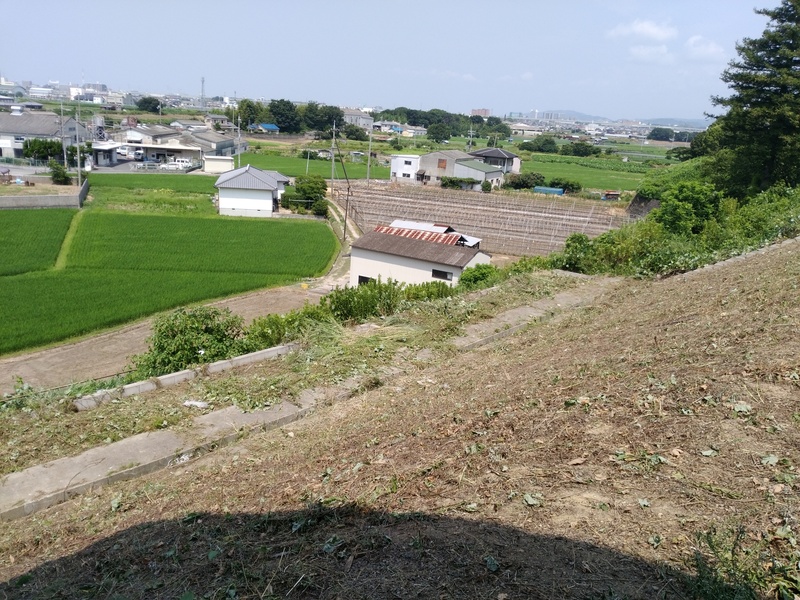 I resently found out my Shakuhacho Sensei’s former student, who I will meet in Oct is a high Komuso in another temple in Wakayama. I will be checking with him on how to become officially connected to this temple. I need to have some official status before I can go out on my own and do this type of engaged practice. The down side, this may take years. Paperwork, licensing is a big deal in Japan. I can understand the reasoning behind this, fakes are everywhere. This thing with the remarks from the Komuso Sensei on FB reminds me of the time a group from the East Coast of the US came to California and gave a private seminar to a group of us, who were having problems getting instruction in California. Well the local Federation had a cow! Even though we could not get help from them, were not in anyones school/ dojo turf, still it started a fire storm! It was both funny and sad. Egos are so fragile. No matter the title, rank, people are people. Ego is ego, you can control it, or it can control you! Zen master, Kyudo master, Kung Fu master, President, I have seen them all be ego puppets. 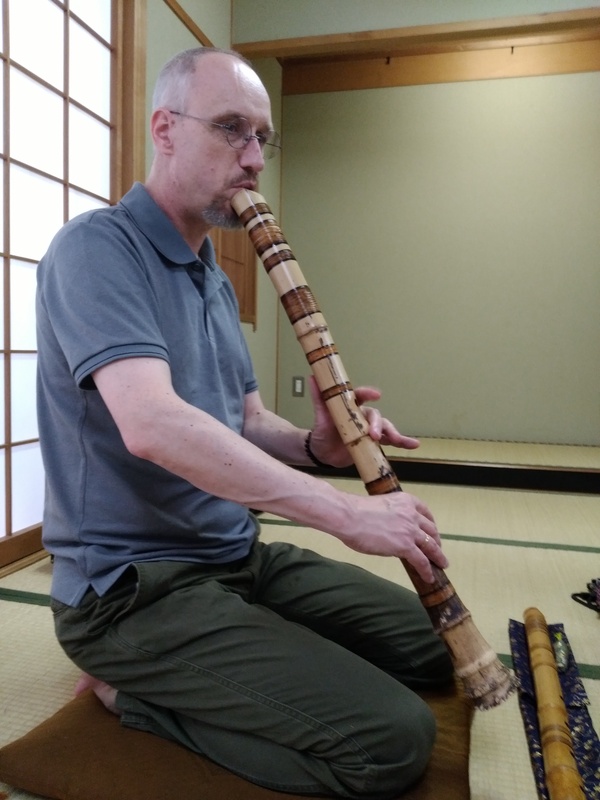 Two years ago, about, more or less, I was looking to join a shakuhachi club. I thought that was the way to go to get lessons. However I found out that is for already knowing how to play people. Then I came across my current Sensei a short while later. Lead by the hand of the Universe I encountered him. Major stroke of luck, or blessing…depends on your view-point! Now two years later I was introduced to someone who is in one of those Shakuhachi groups. I was invited to attend a meeting. 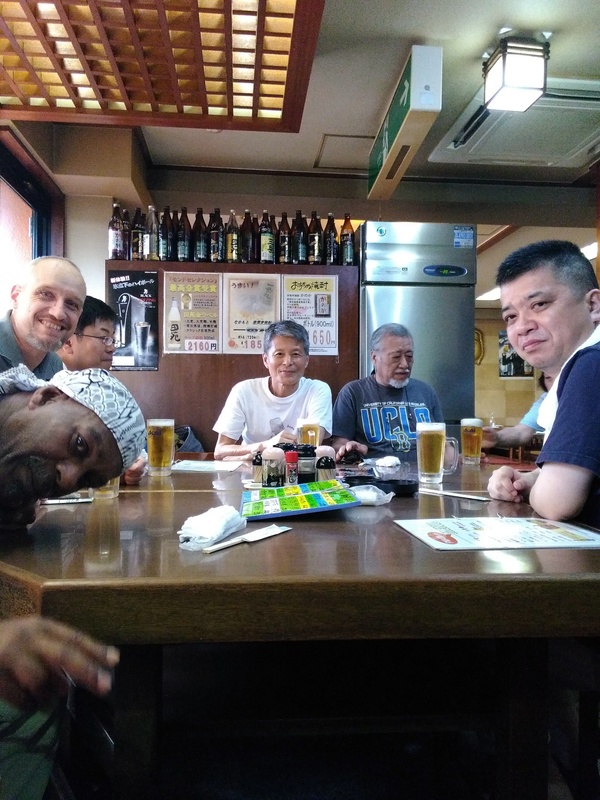 The cool part was that this group was/is in some remote way connected to the Kumoso players in Kyoto. Major Shakuhachi luck strike! I had gone to a concert by some of the members of this group. I do think I wrote about the concert, maybe I did, but do not feel like checking right now… So a little recap now. There were 45 invited players to this concert. Different styles and schools. It was interesting even though I did not see all the players. Which was kind of good, since it would have been a loooong day. Also some of the styles I did not really care for. Eg: the really breathy style. I like the note sound not the breath so much. Ok, the meeting was small. Not all the members attend all the time. There were six of us this time. 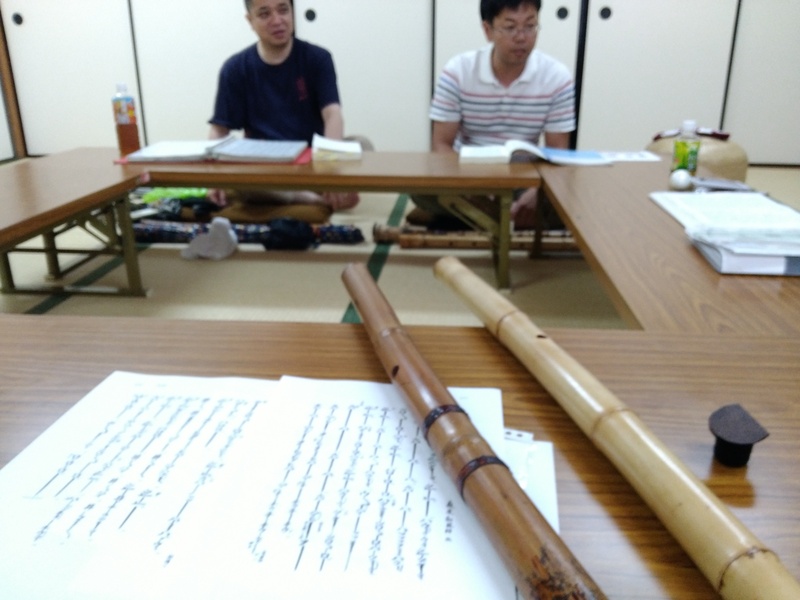 Several of the people there were Shakuhachi makers, one of them a professional. 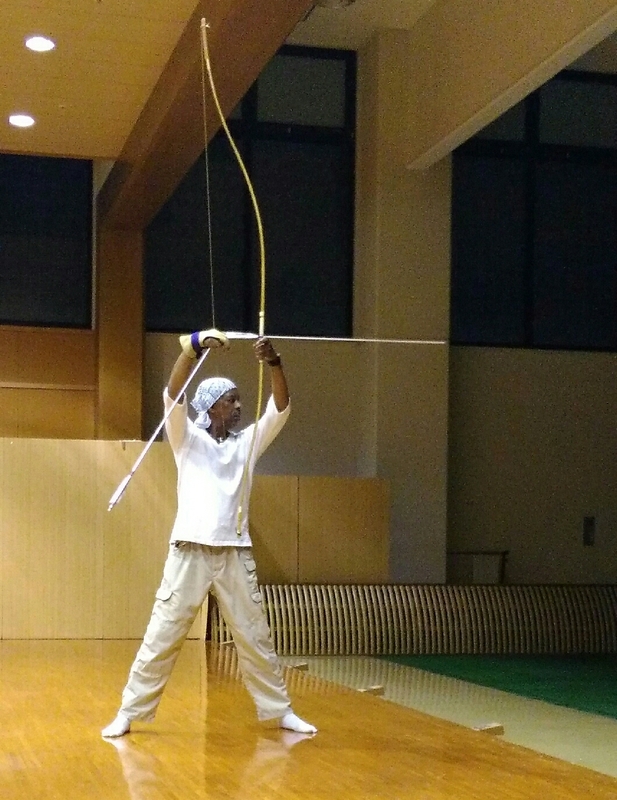 That guy also makes Tengai, for Komuso. He had one with him, the cost was about $1,000 US. Store brought in Japan about $400! Today’s Komuso have money I guess. I have heard about some of the parts for the Komuso-wear are also very costly. Quite shocking for a group that traditionally went around just begging. Most do not beg any longer, so yeah, times have changed. The Komuso ( not all ) have money. 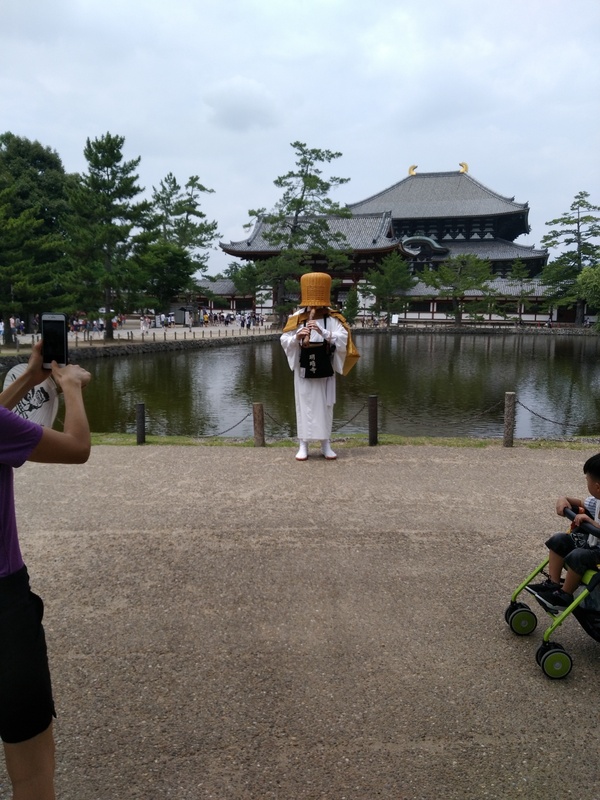 Another two people had their own self-made Shakuhachi with them. Each of them gave me one to try out. This group plays the large Shakuhachi, not the standard size you see Komuso with in pictures. I was told that if I like one it was mine to take home. I was quite shocked! I was told before arriving that one of the players wanted to gift me a shakuhachi as he had plenty he made. I was thinking, one of the small one simple made. However….no this was a big flute, with an inlay at the mouth piece not just cut. I was shocked, I said that, right? So yeah, way cool, I like the big shakuhachi, anyway. I prefer the deep tones. I was given a bunch of music that they were going over. The notation was a bit different from my Kinko style so I easily got lost. My musician ear and watching another player helped keep me somewhat stay up with the group. The first song, the starting off song, I already knew from learning it to do the Komuso walk. So that was not really a big deal, other than playing it on a really big Shakuhachi that I was not accustom to playing. It was good, no one really cared. There was a point were everyone played a piece solo that was going to be in the next upcoming concert. They went around the table, each one playing a song…and came to me. I tried to pass, but was unable. I was told it was ok to replay the song I knew, Cho Shi. Hesitantly I did. There were times I could not get the note out. However following my sensei’s advice I just kept going like it was part of what I was doing. Over all it was not bad. Not good, but not too bad. I thought well at least I did not embarrass myself. I was told it was impressive I could play that well, with a new instrument. I felt relief, yatta! I was asked to tell how I met my Sensei. I was taken back for a bit, because the guys there did not speak English. I surprised myself by just speaking in Japanese. I did not even give it that much thought, to how to explain. I did somewhat ok, until I started to think about what I was doing, then my words got mixed up. Still, everyone understood, and that is more important than the correct word is the communication. Heart to heart communication, like in Chan transmission. 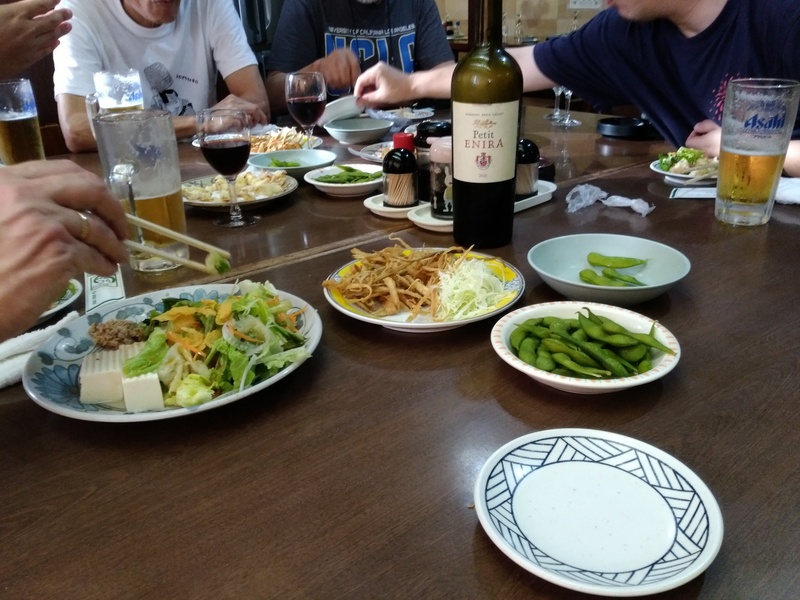 After a few more songs we closed the room up and went to a local shop for dinner. These guys are Shakuhachi freaks! The whole time the conversation was about Shakuhachis and playing, for the most part. I did not get most of it, but my friend translated, that was a big help. My small shakuhachi from the recycle shop was checked out ( looked over), and given a big ok. Some had one also by the same maker. It was not a cheap flute. I felt grateful to the Force for leading me to it.